Last week, my son (age 7) was playing video games and started crying because his sister wouldn’t let him have the seat closest to the TV. He said couldn’t read the words on the TV screen from the other seat. My heart sank. I figured my kids would need glasses someday, but I was not quite ready for it yet. He was only 7! But our kids have a way of following their own timelines, don’t they? I didn’t waste any time and called the next day to get an appointment for an exam with our eye doctor. After the doctor confirmed that he definitely did need glasses for near-sightedness, the challenge became choosing where to buy the glasses. I definitely wanted to find the best value in kids’ glasses! With a rambunctious 7-year-old boy, I was certainly not going to pay the high prices at the doctor’s office. Why would I pay $200+ for something that was likely going to be lost or stepped on the very next day? 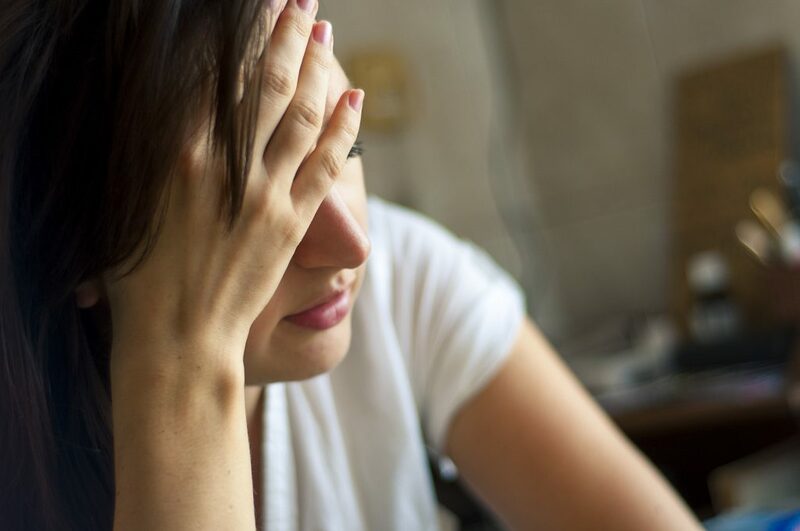 I was disappointed to learn that most of the doctor’s offices and chains offer no coverage for damage after the initial return period (generally 60 or 90 days). Costco Optical has been frequently ranked as one of the best values in glasses, with great service, quality materials, and reasonable prices. The regulations vary by state, but in our area, you do not have to be a member to see their optometrist, but you do need to be a Costco member to buy glasses. Since I already have a membership, it seemed like a choice worth considering. 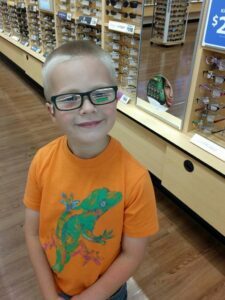 Although Walmart often has a bad reputation in general, moms of kids in glasses frequently sing the praises of Walmart Vision Center. When you look at the numbers, it’s easy to see why! Target Optical just opened a few months ago in my area, so I haven’t heard much about it yet. Since I generally enjoy Target, I thought it was worth checking out. I was disappointed in Target’s cost, though. Breakage guarantee: For an additional $35 you can purchase a replacement warranty that is good for one year with a $25 copay per use. After gathering all the information, it seemed like a no-brainer to start with Walmart. I was quite skeptical of $9 frames, but I was pleasantly surprised when I saw the selection. The $9 frames were generally fairly plain, but felt sturdy and were cute! I actually loved one of the $9 frames on my son, but unfortunately, it was a bit too small for him. Since his favorite color is green, he was very excited to find a Teenage Mutant Ninja Turtle pair that had green stripes down the sides of them. They were also a perfect fit! Happy boy with his favorite color on his glasses! Since he loved the frames so much, we decided to order them. They were the most expensive kids’ frames at $48 so the total came to $97 or $104.28 after sales tax. I was able to pay with my HSA account so that helped with the cost by saving me income tax on that money. Since my son is a bit scatter-brained (what 7-year-old boy isn’t? ), I’m nervous about him losing them, and loss is not covered under the Walmart guarantee (only breakage). 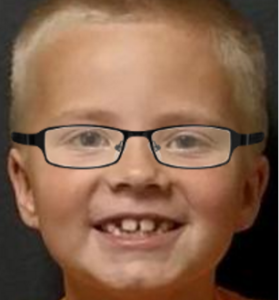 Since I don’t want him to have to go weeks without glasses at school while we order a replacement, I decided to order a backup pair right away. 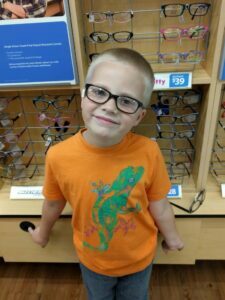 I knew the size of the Walmart frames that fit him and I got his pupillary distance measurement (or PD) from the Walmart technician, so I was able to order another pair online from Zenni Optical. I’ve heard so many great things about Zenni and was excited to give them a try. And the total price from Zenni? $29.90 for frames, polycarbonate lenses with anti-glare, and shipping! To see what I thought of the Zenni glasses, check out my comparison of Walmart vs. Zenni. Two years later, I’m a very experienced mom of a kid in glasses. In fact, my daughter wears glasses too now! My son wore his first Walmart glasses for about a year before he needed new ones. We DID use that warranty TWICE and I was SO glad to have it. You can read more about it in my review of the Walmart Vision Center Warranty. 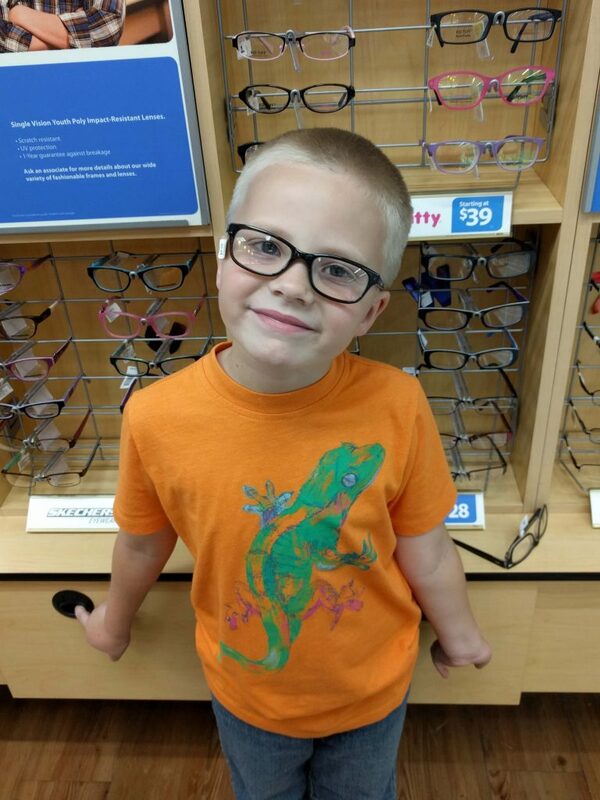 The Walmart glasses were decent quality and an excellent choice for his first glasses because of the low price and great warranty. However, Costco glasses are similar in price to the higher end frames at Walmart, but the Costco frames seem a little higher in quality. I personally prefer the styles available at Costco as well. Now that my kids are a little older and I’m less worried about loss or breakage, I will buy more of our glasses at Costco. 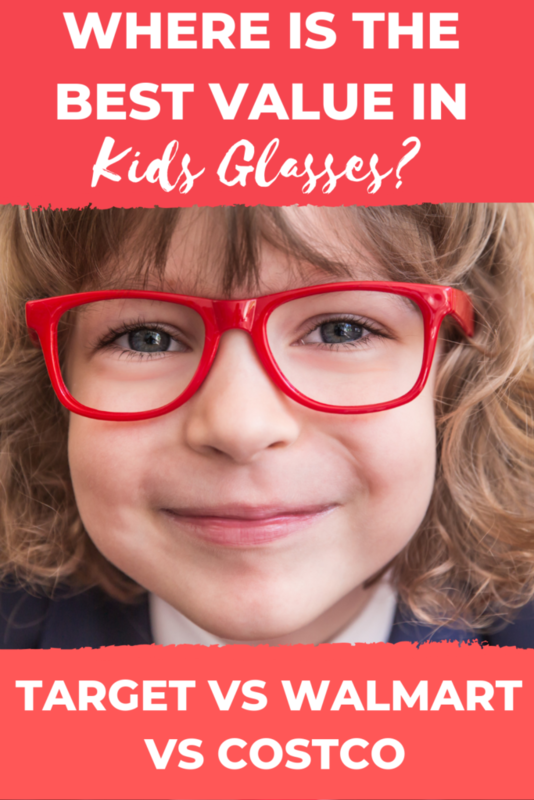 Do you have a child in glasses? Where do you like to buy them? Please comment below! Thanks for sharing and doing all the legwork for me! You never know when you’ll need this helpful information. You are welcome! Yep, you never know! We certainly didn’t expect it to happen when he was 7. So, 2 years later – have you been happy with your purchases? What have you done for subsequent pairs as he’s gotten older? Hi Jen! He had 2 pairs of Walmart glasses and got 2 warranty repairs on the 1st pair. I was satisfied and felt they are decent quality. This year, we had extra FSA money to spare and we bought him a pair from Target and a pair from an optician. They were SIGNIFICANTLY more expensive than the Walmart glasses and I don’t see a huge difference in quality. He is getting older and more responsible so I don’t worry about the warranty as much. I would shop at Walmart or Costco in the future. Costco’s selection just wasn’t very big last time we checked. I just discovered Costco for my 14 year old son. It was $110 for a very nice pair of men’s glasses with single vision lenses since he was under 18 years old. They also will put the blue tint for the electronic screens on for free. I also liked the quality of their frames. They have that slight bend outward and aren’t stiff which helps avoid frame breakage. I buy all my glasses at costco. I agree that Costco glasses are very nice! Sam’s Club has restructured their eyeglass pricing, and has Buy One Get One on any Youth frame, without an age restriction. They start at 59.00, and include polycarbonate lenses for 18 and under, ( just 40.00 additional for adults) with anti-reflective and scratch-resistant coatings, and one year frame and lens warranty. They just updated all of their frame styles as well. Oh wow! That sounds like a great deal! I will have to check it out.